Welcome to my private blog on amateur radio, homebrewing and radio engineering science. First of all: The circuits presented here are free to be used in the amateur community. I don’t sell radios nor do I have any circuit boards or ready made modules for sale. This website is strictly non-commercial. Profession: I graduated from college in science (Physics and IT), earned a teaching degree in secondary education and have been working as a science teacher up to today. Before entering school service I worked as a software and hardware developer (freelancer) for some years. Mainly I was occupied with projects in the field of technique of measurement, database development and macro programming for Microsoft products and learning software. My main language is the “C” programming language, but there also were lots of projects in Visual Basic and PASCAL. Today all my computer work is in the embedded systems sector (ATMEL AVRs) for my private amataur radio material. Amateur radio acitvities: Before gaining my radio amateur licence in 1987 I have long been a homebrewer of radio equipment. Must have been a virus I aquainted from my father who built vacuum tube equipped radios, remote controls for ship models and other radio and electronics related stuff. By the age of 8 or 9 I started to build simple receivers for medium and short wave. I Listened to all the stations from all over the world. Later by accident I found some CBers in my 27 MHz diode receiver and since then I have been hooked to radio frequency communications. It worked pretty well. A friend of mine was able to receive my signals on 80 meters with a modified kitchen radio over a distance of about 10 kilometers. That was fun! 😉 What my parents did not think to be funny were unexpected “visits” of the local police investigating in the case of illegal transmitting activities and confiscations of several technical things from our household like my mother’s kitchen radio. Later I re-participated for some years in CB radio again with homemade AM rigs. I used and refined 27-MHz-remote control circuits that I modified for voice communication. 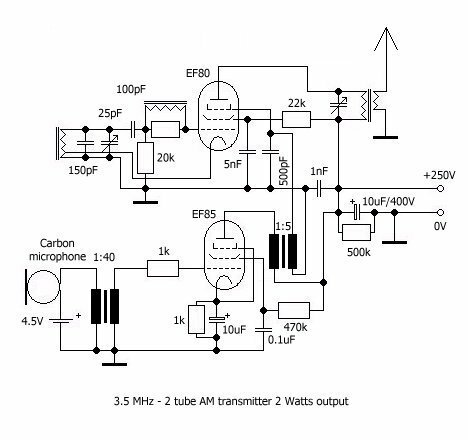 I went away from working with tubes because rf-capable transistors were commonly available for reasonable prices. The schematics for the 27-MHz-RC-circuits had been widely published in literature that time (German authors e. g. Heinz Richter or Gerhard O. W. Fischer) because people were allowed to build their own remote controls for ships and aeroplanes under some limited conditions. My father did so, thus all the neccessary equipment was available in our home. He even owned an oscilloscope, an older Heathkit one. Then I finally decided that CB might not be the right field for experimenting and constructing my own radio communications equipment. I made up my mind to learn morse code (which was mandatory in those times to achieve a short wave ham licence) and afterwards applied and passed the licence exam. Besides technical hobbies I also love sports, e. g. scuba diving, cycling, hiking and, in general, outdoor activities. Feeling unable to communicate well, this is written with google translator. I also like the amateur radio, indicative EA5IQF. … and … scuba diving 🙂 up to 38m,. I would be delighted, with your projects, the radio. Very very very good !! Schemes, very well done, separated into “groups” to see well and understand. Now I, I only have a transmitter of 27 mhz, I like a lot, I also walk 2m. I would like to make your project, project free, strong, not have “scheduled obsolescence” … and be personal. Level I of electronic / electricity. My job is, maintenance in factory, electricity, sensors, transducers, frequency inverters, mechanics, etc. 1) All the project, the materials. how much price to leave, approximate? I program In Mega … never do, if you can mount, but never program or dump data. I try to do, by myself, or seek help, from friends, programmers. 2) In the worst case, if I assemble and mail you, I can send scheduled, I pay the shipping costs round trip and work hours. 3)To be able to do more “rustic” version “for my level”, with VCO, and see frequencies with the Asian frequency meter?